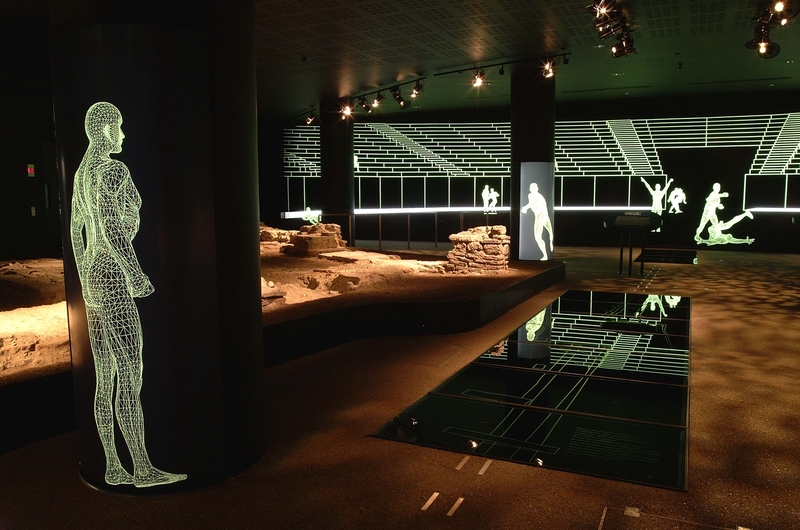 Hidden deep below the Guildhall Art Gallery are the remains of London’s Roman Amphitheatre. Even more exciting is that you can visit for FREE. Back in AD70 work began on constructing a wooden arena, then around AD 120 the whole structure was upgraded to a magnificent stone and tiled building with brightly coloured walls. The population of London at this time was 20-30,000 people and the amphitheatre would have been able to hold 6-7,000: almost 1 in 4 of the inhabitants, the building must have dominated the Roman city. When the Romans left in the early 4th century, the stone from the walls was used as convenient source of building material for new houses and eventually the Amphitheatre disappeared from view. In 1988 the remains were rediscovered during the construction of the Guildhall Art Gallery and eventually opened to the public in 2002. To get to the Amphitheatre, you go the main entrance of the Guildhall Art Gallery and follow a circuitous route down and through double doors. Once through those doors you are in the Roman world. Low stone walls that would have supported the seating stretch out in front of you. Your eye is led to a clever virtual reconstruction of the arena, complete with gladiators. Beneath your feet a glow of light reveals the wooden drains and a silt trap; remarkably the wood is the wood that the Romans laid getting on for 2000 years ago. Back and ground level and in the open air, you will see the outline of the arena is marked in brick in Guildhall Yard and make you realise how enormous the amphitheatre must have been. A jaunt up to London just to see the amphitheatre would be a bit extravagant, so whilst you there take a stroll round the Guildhall Art Gallery with its magnificent collection of pre-Raphaelite and London related paintings. What I love about the amphitheatre is way that the layers of London are shown: you start with the Roman, rise up through the City’s art collection and then emerge into daylight surrounded by the tall glittering palaces of commerce, that are, in turn, interspersed with building sites reinventing the City all over again. Whilst you are in the area take time to stroll down to Cheapside to hear Bow Bells, if your visit has coincided with time for a coffee break or even lunch then good food can be found in the thousand year old crypt of St Mary le Bow Church at Café Below on Cheapside. Definitely one of London’s lesser known gems, when i visited we were the only people there but the space is just amazing. As you say – it doesn’t take long but the gallery is an added bonus. We’re both highlighting underground attractions this week! I had no idea this was here – very clever use of technology to help visitors imagine what it would have looked like. Living near Hadrian’s Wall, we love a bit of Roman History and would love to take a peek around here. Even better that it’s free! I didn’t even know London had a Roman amphitheatre. This reminds me a little of the entrance to York’s Viking Centre, so much history under our feet. I like the look of the virtual reconstructuon, such a good idea. I’d not heard of the amphitheatre, I’d definitely like to pay it a visit. Do you think it’s suitable with little kids (6 and 3)?